Army Sergeant Louis Lund joined the military in November of 1995 because he wanted to care, protect and provide for his family. 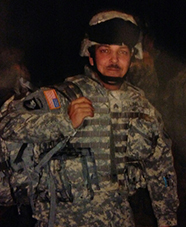 In his fifteen years of service, Sergeant Lund served two tours in Iraq, one in Afghanistan and one in Kuwait. It was in the early years of his service when Sergeant Lund sustained a back injury, necessitating surgery in 1997. He continued his service and the pain agitated over time until another serious back injury required him to have a spinal fusion operation in 2009. That injury occurred in 2008 when Sergeant Lund was coming down from a Hesco security barrier while he was serving in Afghanistan. Sergeant Lund was the recipient of many commendations during his years of his service. He has earned the Afghanistan Campaign Medal with One Star, Iraq Campaign Medal with Two Stars, Army Commendation Medal (2x), Army Achievement Medal (2x), Joint Meritorious Award, Good Conduct Medal (4x), National Defense Medal (2x), Global War on Terrorism Service Medal, Expeditionary Medal, Non-Commissioned Officer Professional Development Ribbon, Army Service Ribbon, Overseas Service Ribbon (4x), NATO Medal, and Driver and Mechanic Badge. Sergeant Lund and his family received a mortgage-free home in Davenport, Florida in 2016.